One hatches, more to come! The Spanish for German course has rolled into its beta phase. 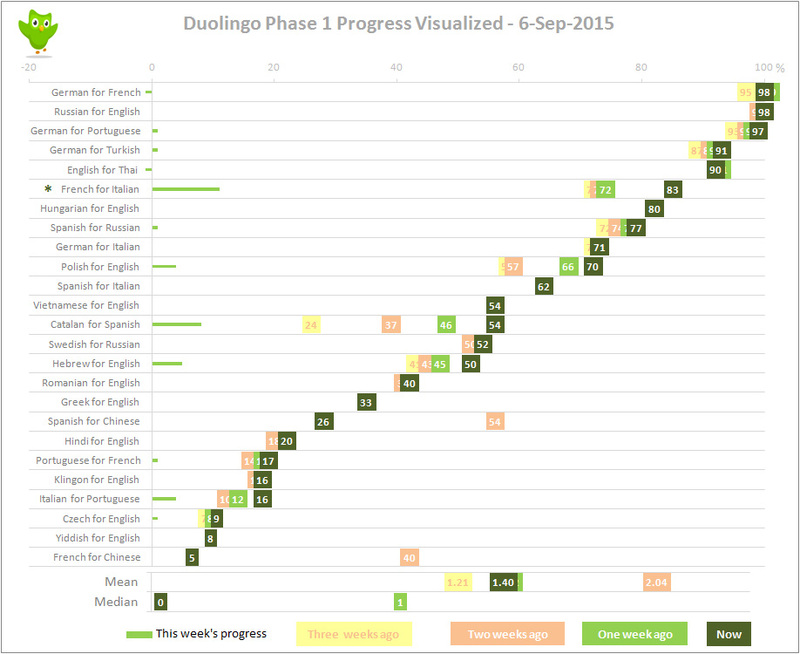 Congratulations to the course team and to the Duolingo staff! We still have five courses in the nineties. In most situations, the courses move to the beta phase when they are at 98% or above. Learn Spanish, this time from German! * This week's Leader Extraordinaire! Mojn venner! First off, we want to say sorry for not having written an update sooner, but things have been crazy with us contributors! (2) My name is Mads, and I'm a native Danish speaker from Copenhagen. Like Samantha, I've been a part of the team since February. It's been an amazing six months! You might have seen me on the Danish forum, where I, like my five fantastic team members, try to help learners figure out the quirks of this neat language of ours. I've just started my gap year after graduating from high school in June. The next year (probably the next two) is the reason for which I'm learning languages, especially Spanish, which I have been learning for three years and completely fallen in love with. I will be using it for my trips to the US and South America, and I cannot wait! 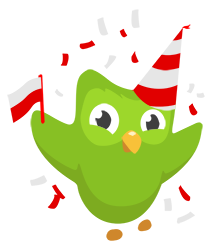 Much kærlighed and held og lykke to all of you in your quest to master Danish. We also finally graduated from beta at the beginning of February, and since then we've been working hard addressing some of the glitches and mistakes, working on Danish language assignments and what not. We're also super excited about all the feedback and all the followers we've gained! We'll keep working to make the course better. Apologies, Mads & Samatha, I accidently made that an even longer time no see! Officially 319 words. Let's say 9 percent done. But we are assembling a spreadsheet of the words in the course so far, and the count is 400 with a partial list. Maybe Duo uses a special method of counting? The spreadsheet should let us share work and speed it all up. Quase lá =P /// À procura de contribuidores! Primeiramente obrigado a todos pelo apoio durante a construção do curso. Estamos quase terminando, falta traduzir as frases das três últimas lições e escrever mais notas. Ultimamente temos recebido várias mensagens de pessoas querendo ser contribuidores, porém na maioria das vezes faltam informações imprescindíveis! Como: Qualificação (Escolaridade, curso superior) e disponibilidade de tempo (quanto tempo por dia ou por semana estão disponíveis). Nós precisamos ter certeza de que a pessoa é qualificada, então por favor tenham como base 200 palavras. Caso você mude o nome de usuário ou e-mail mande uma nova candidatura. Na fase em que o curso atualmente se encontra estamos a procura de pessoas que nos ajudem a escrever as Notas, que são textos com explicações sobre a gramática da língua alemã que acompanham as lições. Se você é formado em Letras Alemão (ou Germanistik, para os alemães) é de você mesmo que precisamos! Erstens vielen Dank an alle für die Unterstützung während des Aufbaus des Kurses. Wir sind fast fertig, wir müssen nur noch die drei letzten "Skills" und die Notizen fertigstellen. In letzter Zeit haben wir mehrere Bewerbungen empfangen, aber häufig fehlen wichtige Informationen! Qualifikation (Bildung) und die Zeitverfügbarkeit (wie viel Zeit pro Tag oder pro Woche zur Verfügung stehen) sind Beispiele davon. Wir müssen sicher sein, dass die Person qualifiziert ist, deswegen möchten wir euch darum bitten, dass ihr wenigstens 200 Wörter schreibt. Wenn ihr euren Benutzernamen oder E-Mail ändert, bewirbt euch bitte erneut. Derzeit suchen wir Personen, die uns mit den Notizen helfen können. Notizen sind Texte, die wir selbst schreiben müssen, mit Erklärungen der deutschen Grammatik. After a very active week and many decisions that were made, we have finally reached 50%. So now, we've basically hit the "middle marker" but we've still got a long way ahead of us. This week we had a better progress than the last few weeks thanks to a wonderful contribution of many of our contributors! Remember you can also join our Facebook group where you can ask questions about Hebrew, here. This is not an easy question to answer. A short answer is: I do not know. There are some good arguments both for taking the Ukrainian course and for not taking it. But if you do, we compiled an overview of differences between language you will find. Feel free to consult our Russian learner's guide to the Ukrainian course! Shady_arc's writing this update on the Russian course page provides the real context for the question posed above. The question is meant for those who are interested in the upcoming Russian course. For all those who are interested in the Ukrainian language - "Sure, yes you should try Ukrainian :)"
신고는 똑같은 문제를 두 번 이상 옳은 답을 했을 떼 오답 처리가 되면 하시길 바랍니다. 듀오링고는 100% 사용자가 생각하는 것을 알 수가 없습니다. 듀오링고는 인공지능을 갖춰서 저절로 한국어를 배워 구사하는 것이 아니라. 기계이기 때문에 입력에 대한 출력만 가능합니다. 참고로 듀오링고는 현재 답 3,000개만 수용할 수 있습니다. 한국어의 특성상 문장 하나를 수백 개의 다른 문장으로 표현할 수 있으므로 모든 정답을 허용하는 것이 몹시 어렵습니다. 어떤 경우에는 한 영어 문장에 3,000개가 넘는 한국어 문장이 정답이 되는 경우가 많습니다. 이 점을 이해하시길 바랍니다. 듀오링고 영어->한국어 과정은 이 과정이 졸업을 해야지 가능합니다. 이 점을 이해해주시고 신중하게 신고를 하시길 바립니다. For users using Korean to learn this course: I would personally not recommend for you to learn Korean through this course, as the Korean in this course is not that natural. Also, this course is not optimized for learning Korean, so are the hints. This is why that if you try to compose an answer using hints, they might not be always accepted (as they are unnatural or wrong). I request that learners also carefully report (and only report when you are sure it is right ^^). È rimasto meno di 1/4! TL;DR The Spanish for German course has hatched. At least 3-4 more courses are almost getting there! The next update is expected on Sunday, 13th of September at 6:00 pm UTC delayed due to travel. Last updates from the recent months: 2015: Aug, Jul, Jun, May, Apr, Mar, Feb, Jan.
People with anxiety should not be following the incubator. POLISH! POLISH! POLISH! POLISH! POLISH! POLISH! POLISH! Wooooooo!! Seriously, I'm so excited for the course! Thanks for the updates & congatulations on your 666 day streak! Too bad we've lost Team Hungarian again. :( Would be nice to know how the regrouping is going . I think it's still moving though. I have a userscript that shows percentages for the courses. Granted, they aren't accurate for Hungarian, but the number has moved every couple of days, so work is being done. Thanks for all the updates! I'm still anxiously awaiting for the "Greek For English" course to come out. My best friend is Greek, my neighbors are Greek, I know a few more Greeks, and a lot of the seniors I used to work with are also first generation immigrants from Greece. Plus, I've actually been to Greece and hope to return some day. Totally agree! While I am waiting for Polish and Hindi, it is Greek what I am really anxious about. And is it possible to go to Greece once and not want to return some day? :)) I've been twice, sea kayaking. We have been busy with personal matters recently. Should be get back on track in the beginning of October. Thank you! We'll be back soon! This is why that if you try to compose an answer using hints, they might not be always accepted (as they are unnatural or wrong). I request that learners also carefully report (and only report when you are sure it is right ^^). So does this mean that people who use the English for Korean speakers course to learn Korean are one of the prime suspects for the reasons that the course cannot leave beta, and therefore they prevent the team from creating the actual Korean course? Looks like a German for Arabic speakers course could be a useful addition to duolingo if some good volunteer course builders are able to commit to the effort. Arabic is the official language of Syria. I know there are a range of dialects in use but MSA is the standard dialect used in education so that might be the best one to use as the ‘from’ language. Go Klingon! I'm rooting for you! They expect to be ready for Beta in around a week! Did any other Spanish learners find it weird but awesome to understand the Portuguese in this update? This Portuguese learner finds it awesome. Thanks for the update! I cannot see the image, though? When do we have Chinese for English? Spanish for Chinese Team !!! Go Go GO ! Fighting !